This is a list of pre-release and unused content for the game Mario Kart: Double Dash!! The models of the characters are from Super Smash Bros. Melee, and Mario and Luigi are seen in this trailer of a very early build of the game, driving separately, each in a simple, blue kart. It was originally called Mario Kart for Nintendo GameCube, and it is likely that this early build of Mario Kart: Double Dash!! was overhauled for the final game, as it resembles nothing like it. Several screenshots released during the development of the actual Double Dash!! build shows different textures, tracks, speedometer HUD, and racer mugshots. Early Luigi Circuit. The later version has different textures, and also note that the incorrect race placement. Early Dry Dry Desert (GCN). The hot air balloons were removed in the retail version. Early Mushroom City. The final revision has only one Wiggler Wagon in the course. Also note that Bowser is a partner with Mario and another is with Bowser Jr., as seen on the left of the screen. Early Versus race in Mushroom City. A Versus race in Peach Beach. A Versus race in Luigi Circuit. Versus race in DK Mountain. The original Mario Circuit had a warp pipe, shown in Interactive Demo Disc 13 (USA), but it was removed in the final release of the game. Early result screen. It resembles the result screen of Mario Kart 64. A preview of an early Luigi Circuit. A race on an early Luigi Circuit. The speedometer was originally shaped like a mushroom. A preview of an early DK Mountain. A race on an early DK Mountain. 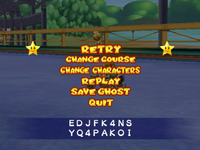 Pressing at the end of a trial mode race (where save ghost and replay are) will bring up a series of numbers and letters, a code that stores the race time, lap time, characters used, kart used and course I.D. This was used for a Japanese contest. Some unused data has exists in a Double Dash!! demo from Interactive Multi-Game Demo Disc Version 13. An icon and trophies for a Reverse Cup have been found, which possibly could mean that a cup where the racers drive the tracks backwards was planned. In addition, early character icons have been found featuring Donkey Kong Jr. instead of Diddy Kong. The icon for the Reverse Cup. The early character icons, depicting Donkey Kong Jr. rather than Diddy Kong. Hidden in the European Demo Disc 10 demo is an early version of Sherbet Land. The name of the course is Dekoboko. Inside the objects folder includes a Wiggler Wagon, a Mario tree, an early version of Freezie, and a sign. An early version of Freezie. Toad and Koopa Paratroopa racing on the unused track. This page was last edited on February 1, 2019, at 19:32.